If you're planning an expedition to the remotest parts of the planet, or a race in the most epic places on the globe, then you need the support of Exile Medics. For the last 9 years we have delivered medical care to the most isolated, the most challenging and the most spectacular expeditions and events around the world, from deserts to the Arctic, from the Jungles to the Savannahs- just look at who we've already looked after. There's nowhere where Exile Medics can't do what we do (legally there are a few exceptions). 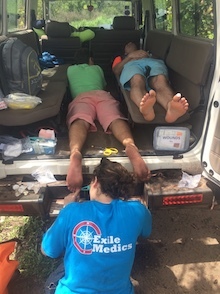 Exile Medics can support you during in planning your expedition or event, deliver medical care during in the field wherever you are, and support your organisation when you touch down back home. Everyone likes to feel cared for, and with Exile Medics, you can be sure that wherever you go, and whatever you do when you get there, Exile Medics will do everything to get you home safely. If you would like to know more, or to talk to us, then email here or use the contact form below, and we'll get back to you- promise. Contact us here and we will get back to you as soon as we can. You can call us on +44 (0) 7471 505430, contact us through Facebook @exilemedicsltd or email directly, or use the form below. What's the best telephone number to get you on? Do you have a website that we could see? Then we might be able to answer any questions we have without bothering you! Thanks for getting in touch. We'll either email or phone you back!